That’s a painting by Vin Jensen under the Eclipse logo. 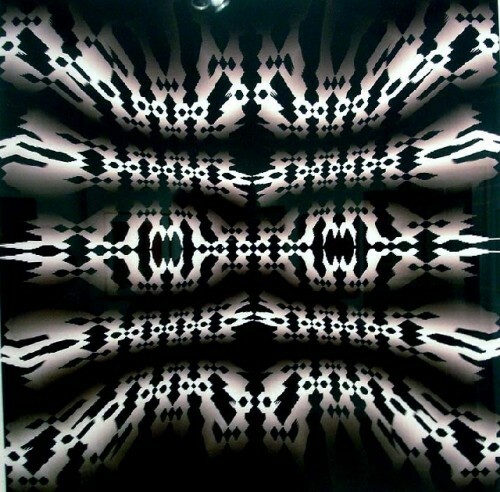 Richard Harrington is back with another intricate Op art creation. 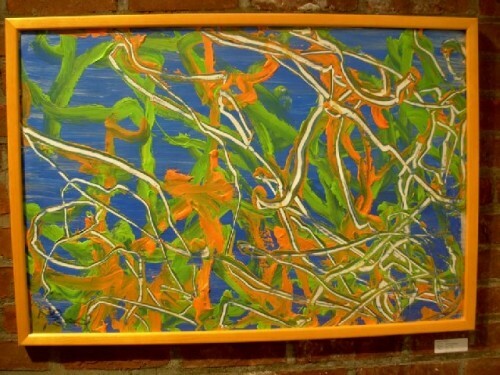 Pennie Brantley and Bob Morgan had a two person show last year in the Eclipse Gallery. Gail and Phil Sellers of River Hill Pottery have developed a new basket design. 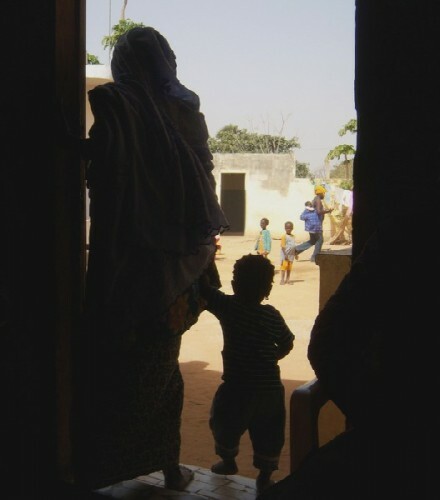 An image from a new Senegal series by Astrid Hiemer. A scratchboard piece by Andrew Klass. 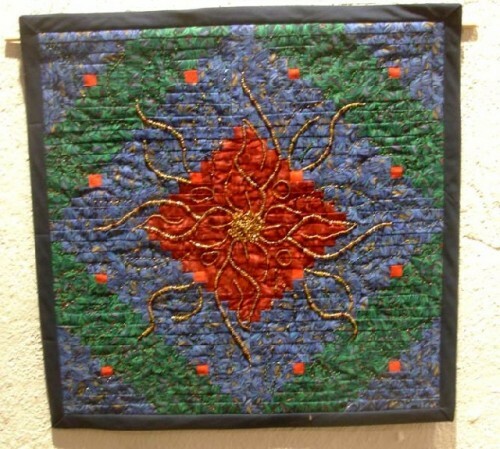 A fabric piece by Beth Davis. A painting by the North Adams Transcript writer Jennifer Huberdeau. 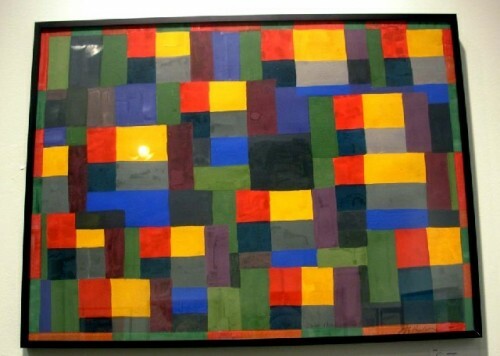 An abstract painting by the student artist Andrew J. Schlesinger. A light sculpture by Salon curator Julie Seitel. A steel and glass sculpture by the Williamnstown artist Len Poliandro. A graphic work by Bill Guild. Geometric abstraction by Jeff Hudson. 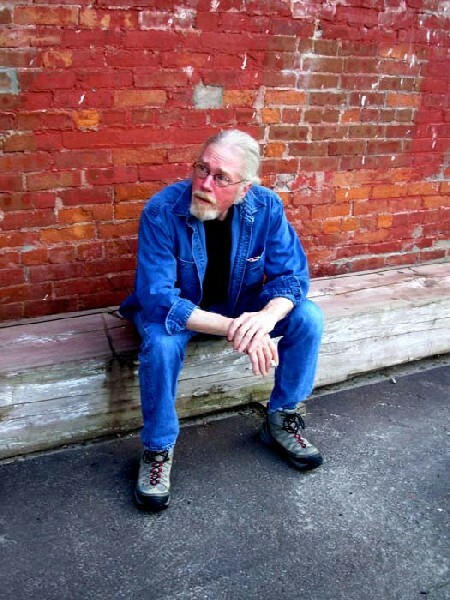 Andrew Davis will run a gallery opening on June 25 as a part of DownStreet. 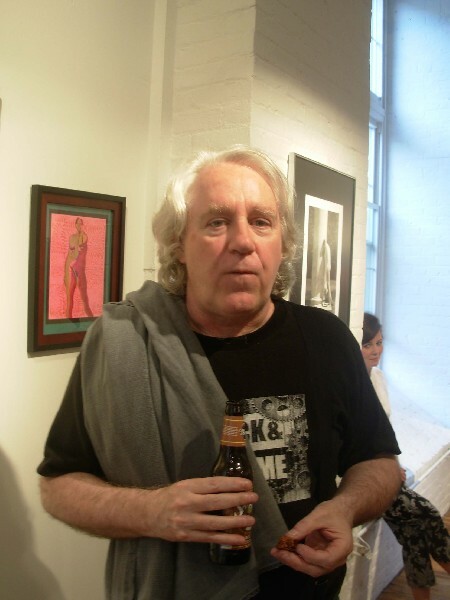 George Aitken helped his partner Julie to install the Salon exhibition. 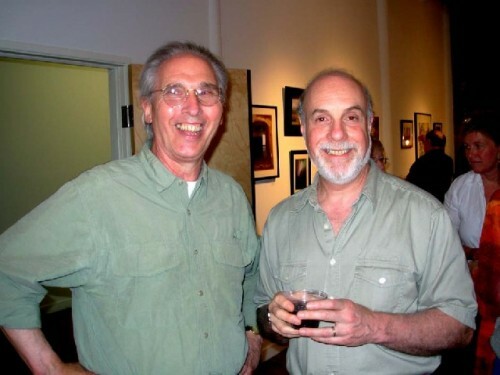 Musician Carl Oman, left, with the artist, Bill Guild. 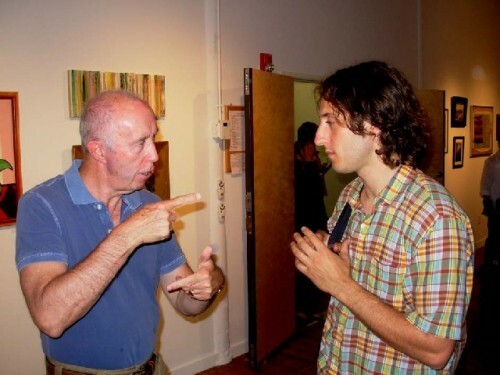 Ed Carson, left, has a pointed discussion with web designer Jason Morin. Jeff Hudson and his wife Jane run North Adams Antiques at Mass MoCA. 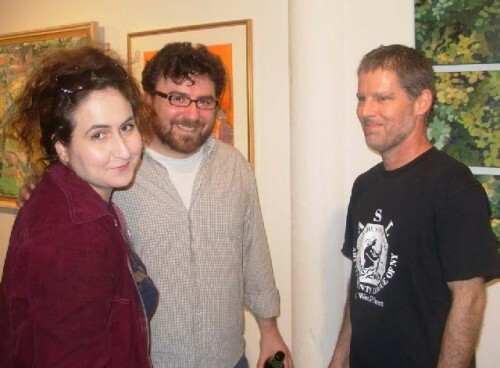 The painters Jaye Foxe, David Lane and Thor Wickstrom compare notes on the Salon. 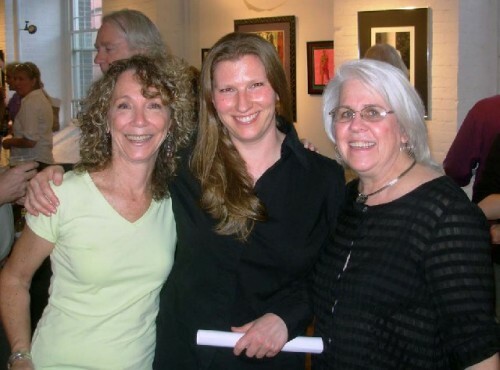 The artists Dawn Guild, left, Julie Seitel and Gail Sellers. 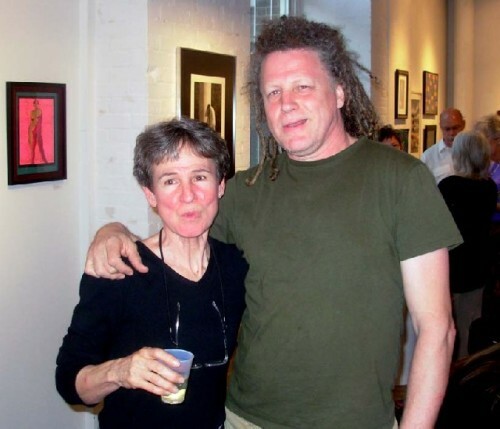 The artist, Susan Graber, with Storefront Artists Project director, Peter Dudek. 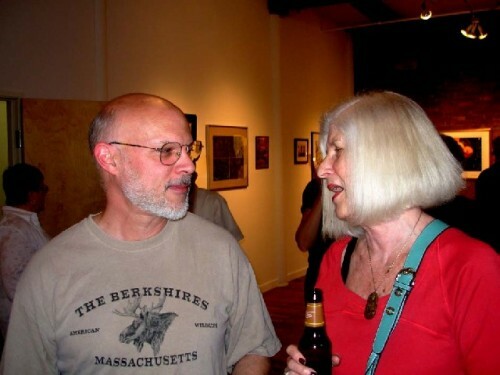 Jane Hudson chats with Berkshire Eagle art critic Keith Shaw. 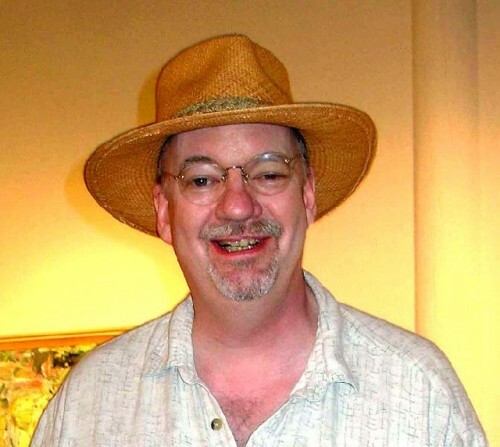 Brian handspicker is the chair of the Eclipse Gallery Committee. Hours: Friday through Sunday, Noon to 5 PM. 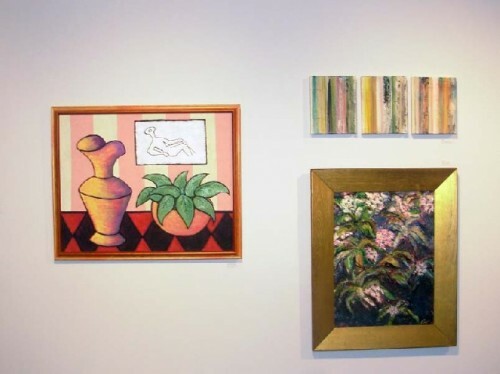 The Second Annual Berkshire Salon, which opened on Memorial Day Weekend with work by 55 artists on view was such a great success that it is well on its way to becoming a much anticipated tradition. It is a terrific way to kick off the exhibition season for the Eclipse Mill Gallery in North Adams. In a note to Eclipse residents, Julie Seitel, the curator of this year's Salon wrote "What a fantastic opening! Thanks and congratulations to all of our Berkshire Salon artists. I was thrilled with the turnout and enthusiasm, and very much enjoyed the chance to get to know many of you better. 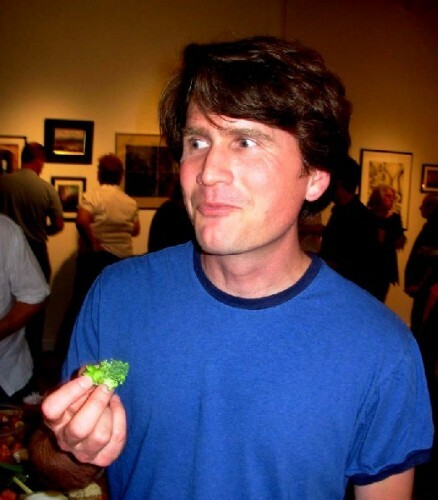 "I'd also like to extend thanks from the entire Gallery Committee and to all of you for your generous contributions of food for the opening--you brought great, tasty stuff, and a huge variety. This made it very easy on our committee members and, believe me, resulted in much more interesting and high-quality cuisine than if we'd been left to our own devices. "Thanks also to those of you that have signed up to gallery sit. Believe it or not, EVERY slot has been covered, from opening day through closing. You guys are fantastic. Susan Graber, Bruce Koscielniak, and Phoebe Pepper, thanks for covering slots during the last two days." Artist and fellow gallery committe member, Vin Jensen, commented that "I'm getting out of my seat for this standing ovaction, An exceptional curatorial debut by Julie. I'm impressed by her powers of organization and presentation with extra touches including logos on the labels, thumbnails on the check list. She has raised the bar and made the job easier for future Eclipse curators." It is also the second season for DownStreet, an effort spearheaded by the city of North Adams and MCLA to take advantage of vacant storefronts. The temporary galleries which will open at the end of June and run through October drew some 15,000 visitors last summer. The program has doubled to some 24 participants and is far more ambitious in range. There is also more evidence of trying to pull together all of the area arts presenters including the Eclipse Mill Gallery and its other venues, River Hill Pottery and the Ralph Brill Gallery. The second version of the Berkshire Salon and its better connection with the efforts of DownStreet is assuring greater momentum particularly in PR and marketing. Once again the Eclipse venues are included on the map published by MCLA. But there is a greater presence in the overall marketing. This is the tenth season for Mass MoCA and a part of that story is how one of the largest contemporary art museum in North America has spawned a thriving arts community. The Eclipse Mill, an artist living loft compound of some 40 large scale studios would not have happened without its proximity to Mass MoCA and nearby Williamstown with Williams College and the Clark Art Institute. Not that these cultural destinations have a measurable impact on the daily life of artists in their studios. For many the struggle to survive in an economically depressed region of the Commonwealth does not leave a lot of time to explore the full range of cultural opportunities represented by Mass MoCA and the venues in Williamstown. Until this season, and the new version of DownStreet, it has not been clear just what synergy existed between Mass MoCA and the related arts community it spawned. While there is evidence of progress a lot of work remains to be done in creating a cohesive and prospering arts community. In launching an ambitious season of North Adams based exhibitions and programming it will play out during a time of significant economic challenge. All across the Berkshires arts organizations, including Mass MoCA, have seen budget cuts of about 20%, that have entailed pay cuts, programming reductions, and layoffs. Typically, when there are cutbacks they most immediately impact PR and marketing budgets. So one of the challenges will be to get the word out. This is further complicated by the fact that the usual media resources have also suffered severe cutbacks including hiring freezes, reduced advertising, and less space for arts reporting. A compelling aspect of the arts community is its creativity and ability to adapt. Tightening the belt is nothing new for artists; rather it is a traditional way of life. Often adversity has a way of fueling new creativity. This is precisely the can do, positive energy that was so evident last night in the Berkshire Salon. 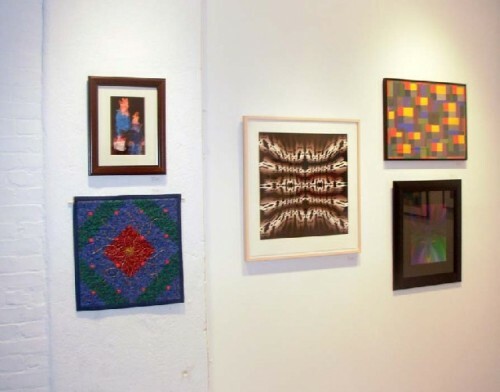 The spirit and intention of the non juried exhibition is to reach out, identify, and welcome the arts community. It is left to participating artists to define themselves. Everyone was welcomed. This resulted in an eclectic mix of work which proved to be vital, diverse, and engaging. There were lots of surprises and discoveries. The point is to overcome a norm of elitism that is all too familiar. 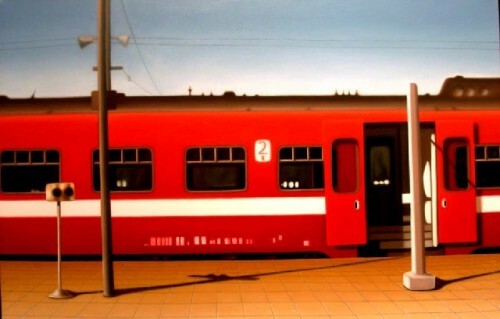 In a regional arts community, after an interval of time, exhibitions recycle work by the same artists. Now and then it is good to stir the pot and see what happens. This is precisely the fun, energy and spirit of the Berkshire Salon that combines established and emerging artists. For some participants it is the rare opportunity to see their work in a professional context. It's a tough job to install so much diverse work and make it all look good. This year that responsibility fell to the lighting designer and sculptor, Julie Seitel, who works in the Theater Department of Williams College. She did a first rate job and enjoyed the challenge. Julie said that she had lots of offers to help but politely told volunteers that she mostly wanted to do it herself. With a lot of help from her partner George Aitken. We found George outside taking a break during the opening. He related that he had enjoyed giving Julie a hand. 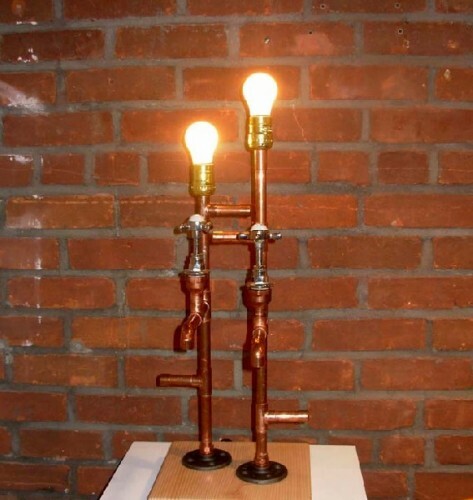 The exhibition includes a light sculpture by Julie that entails copper tubing and plumbing elements. These sculpture pieces evolved from a project for a play last fall. The project inspired her to make individual works and she showed one of the first in the Eclipse Annual last October. 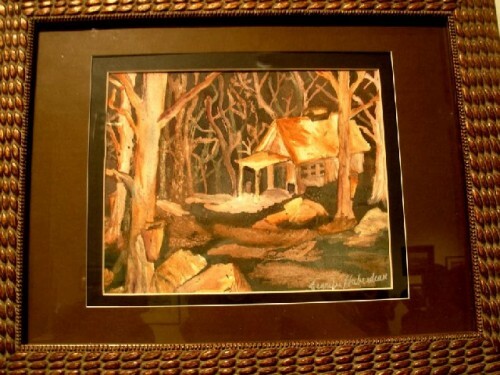 In fact, we bought the piece and Julie stated that it was her first sale as an artist. Now she is working hard on a new series which will be included in an exhibition she is curating for the Eclipse Gallery later this season on the theme of light as an element in art. As a part of that project the Boston artist, John Powell, intends to light the Eclipse Mill at night transforming it into a spectaculas sculpture. This is just one of several ambitious exhibitions planned for the Eclipse Gallery season which extends through the New Year. It is great to see the gallery prospering under new leadership. The Chair this season is Brian Handspicker the partner of the craft person, Beth Davis, who has a fabric piece in the current exhibition. Once again it is encouraging to see so many of the 48 artists from last year again participating. The overall number has grown to 55. It is likely that participation will increase each year as the event becomes more established. There was also enough momey earned and carried over from last season to allow for a modest amount of advertising and marketing. Julie has done a terrific job creating posters and flyers. With some 55 participating artists it is not possible to describe every work. There are so many highlights. 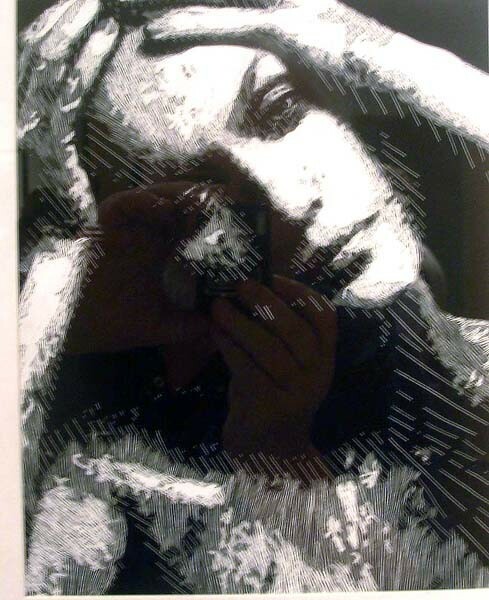 Once again Andrew Klass who attended MCLA this year is showing a new scratch board piece. He was one of the real discoveries in the first Salon. 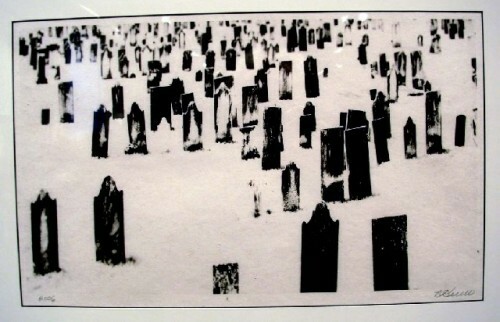 The greatest find this time is the handicapped student Andrew J. Schlesinger who was discovered by Phil Sellers the curator of the student based show Young at Art that preceded the Salon. We wrote about the remarkable work and it was good to meet his parents. He is showing another of his truly remarkable abstract paintings. 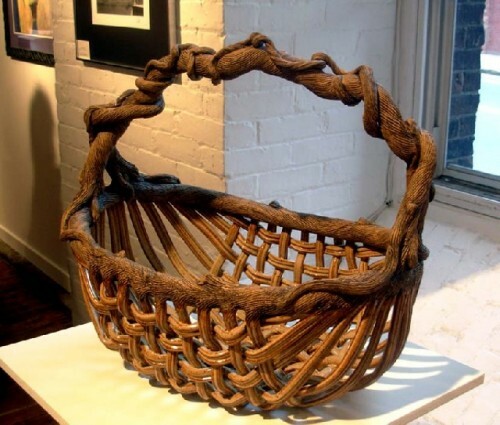 Phil and Gail Sellers are excited about a new basket that they have developed. Relatively new owners Bill and Dawn Guild are showing their graphics and paintings. They bought a loft from art and antiques dealers Jeff and Jane Hudson who are both back as participants in the salon. Jeff is showing a geometric abstraction and Jane a landscape photograph in a vintage frame. There is a remarkable geometric Op inspired design by Richard Harrington. He has shown this year with Greylock Arts in Adams. Astrid Hiemer is exhibiting an image from a series created in Senegal. North Adams Transcript writer, Jennifer Huberdeau, is once again participating this time with a small evocative, romantic landscape. 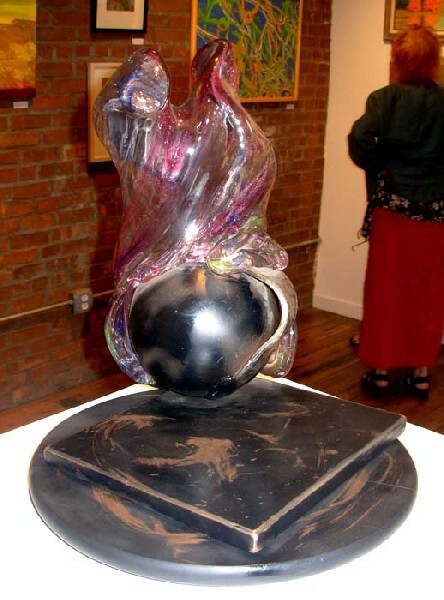 Len Poliandro is showing a work that combines steel and molten glass. Last year Robert Morgan and Pennie Brantley opened the season with the Salon and returned with an exhibition of their realist painting. They are again featured in the Salon. 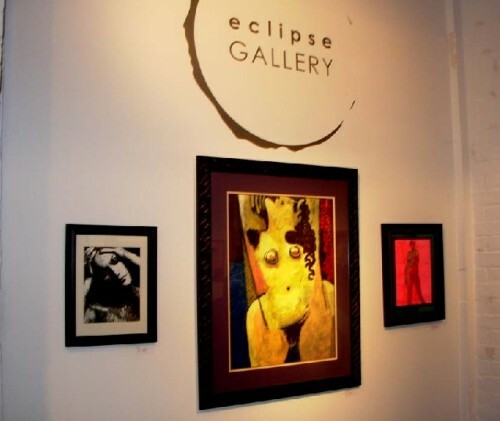 There are lots of works by such familiar Berkshire artists as Jaye Fox, Vin Jensen, Norm Thomas, Joan Kiley, Karen Kane, Thor Wickstrom, Chip Joffe Halpern, David Lane, Terry Taft, Rodney Wilkinson and Bruce Koscielniak all of whom have participated in several Eclipse and DownStreet shows. The exhibition will be on view through June 21. This year there will be expanded hours on Fridays as well as weekends from noon to 5 PM. Come on down. After visiting the Eclipse Mill Gallery you might drop by Mass MoCA. And drive over to Adams to visit our friends at Greylock Arts on Summer Street, There's a lot to see in Northern Berkshire County. "Thanks Charles for covering the event! RS Nover"
"As always,terrific writng. Enjoyed the way you wove the arts of Northnern Berkshires together. "